RivaTuner erlaubt, das Maximum an Leistung aus einer nVidia Grafikkarte zu holen. In den Händen unbedarfter Anwender kann das Tool aber auch schnell zu einem nicht mehr kontrollierbaren Werkzeug werden, das in einigen seltenen Fällen eine Grafikkarte sogar vollkommen unbrauchbar machen kann. Low-level hardware access interfaces are now re-initialized properly before restarting the plugins when changing display adapter selection in the main tab. Updated databases for Detonator and ForceWare drivers. Added database for ForceWare 177.98. Added experimental AMD RV710 and RV730 graphics processors families support. Thanks to Andrey Vorobiev for testing RivaTuner with AMD RADEON HD 4670. Ability to use RivaTuner for low-level diagnostics, hardware monitoring and fan control even when Windows is booted in VGA mode (e.g. in safe mode or with no display driver installed). Ability to use RivaTuner for low-level diagnostics, hardware monitoring and fan control for slave display devices in SLI / Crossfire mode invisible for OS. Attached display adapters detection time has been reduced due to optimized PCI bus scanning routine. Furthermore, both attached and unattached display devices detection are optional and can be forcibly disabled via DetectAttachedDevices and DetectUnattachedDevices registry entries for startup time optimization. Improved secondary display adapter heads enumeration. Now RivaTuner mirrors primary head specific settings (e.g. overclocking and fan control) into the secondaty head UI. Optimized startup time due to improved object dynamic/static casting in hardware abstraction layer. 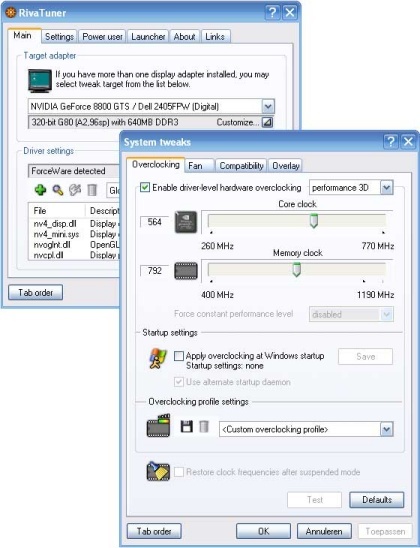 Added experimental overclocking support for the secondary display adapters in Crossfire systems (only for Windows Vista). Added experimental low-level fan control and overclocking settings cloning modes. When cloning mode is enabled RivaTuner clones and automatically applies the same low-level fan control or overclocking settings to all identical devices (i.e. the same display adapter models, different brands are allowed) installed in the system. Please take a note that currently these modes are available to power users only and can be enabled via EnableFanControlCloning and EnableClockControlCloning registry entries. Updated exceptions list for bundled D3DOverrider utility. Added Vcc and Vccp voltages monitoring support. Now The the plugin can monitor state of +3.3V supply voltage of ADT7473 chip (Vcc) and additinal optional voltage input (Vccp), which can be used to monitor different display adapter related voltages depending on the PCB design (e.g. memory voltage on RADEON HD 4870 X2 series display adapters). Improved fan speed monitoring for fans with non-standard pulses per revolution count on tachometer output. Now the plugin no longer uses hardcoded calculations for standard fans with 2 pulses per revolution and can provide correct RPM monitoring for such systems (e.g. fans with 4 pulses per revolution on NVIDIA GeForce GTX 260 / 280 series). Now the plugin is able to monitor independent temperatures of VT1105/VT1165 voltage regulator phases (slave chips). Improved temperature monitoring for RV710 / RV730 / RV770 graphics processors family. Now RivaTuner is able to monitor independent temperatures of display controller, memory controller and shader core on RV7xx graphics processors. Please take a note that unlike many other diagnostic tools reading these temperatures via GPU's internal sensor switching and calibration logic, RivaTuner reads these temperatures via direct access to thermal sensor's ADC outputs and calibrates ADC readings at software level. Such approach drastically reduces CPU load and doesn't have side effects like fan speed fluctuations caused by frequent sensor switching, however it is in experimental stage yet so please contact me if additional core temperatures reported by RivaTuner and other software like GPU-Z or Everest seriously differ on your system. Please take a note that traditional sensor switching based access to these temperature sensors can be also enabled for debugging and performance comparision via ATIThermalSensorAccessModeR7xx registry entry. Optimized GPU usage monitoring for RV710 / RV730 / RV770 graphics processors family. Now RivaTuner is no longer waiting for response from on-die PowerPlay microcontroller if GPU usage is not sampled yet and returns the previous cached value instead. Now hardware monitoring plugin activation wizard module enables ADT7473 plugin by default on AMD READEON HD 4870 X2 series display adapters. Improved /SD and /SELECTDEVICE command line switches handler. RivaTuner's GUI is no longer activated and displayed when current display device selection is changed via these command line switches. This improvement allows you to switch target display device in multimonitor or multi-GPU SLI/Crossfire systems via hotkeys without leaving 3D application. Added I2C bus disconnection feature for ATI RV6xx/RV7xx I2C controllers. Now RivaTuner is able to mark I2C bus as unused and exclude it from further detection when I2C controller is not responding to the transactions through this bus during specified timeout. Bus disconnection feature drastically reduces I2C devices scanning time on some systems with missing I2C buses (e.g. on the secondary chip of AMD RADEON HD 4870 X2 having no physical connection to I2C bus). Please take a not that I2C bus disconnection can be disabled via AllowI2CBusDisconnection registry entry if necessary. Default timeout for ATI I2C transactions has been reduced from 2 seconds to 0.5 second. Now power users may adjust the timeout using ATII2CTimeout registry entry. Improved duty cycle generation accuracy for all types of on-die and external fan controllers due to floating point calculation usage.